pound steel rails cost twenty-five cents. The line proved so successful that a second route between Dallas and Fort Worth opened the next year. A fourteen-mile track began operating between Belton and Temple and by 1909 the original line extended all the way south from Denison to Dallas. In five years the line moved further south to Waco and other lines began between Beaumont and Port Arthur, El Paso and Ysleta, and Houston, Baytown, and Goose Creek. 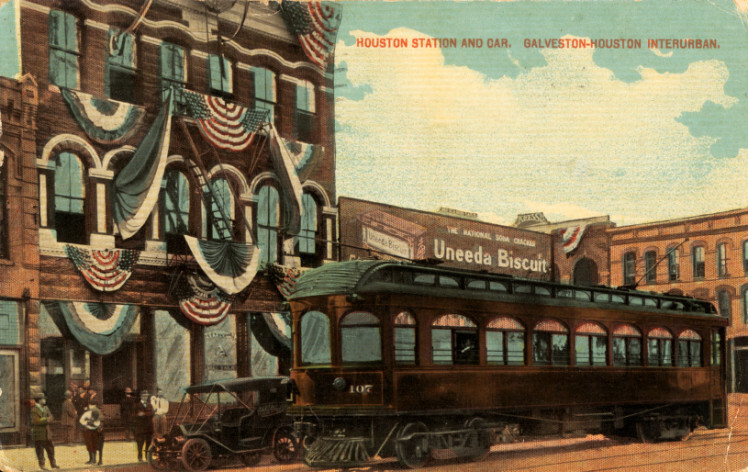 The interurban between Houston and Galveston started carrying passengers in 1911 after Galveston completed its amazing rebuilding following the devastating 1900 storm. The city constructed a seventeen-foot seawall, raised the entire level of the island, and opened a new $2 million causeway to the mainland with tracks to accommodate the electric interurban line, railroad tracks, and a highway. 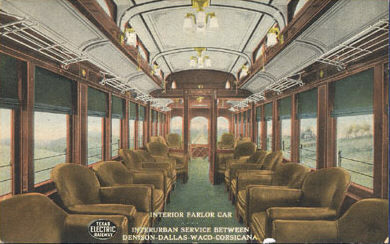 The Houston-Galveston Interurban boasted an observation car on the rear and the fastest schedule of any steam or electric railroad. It made the fifty-mile downtown-to-downtown trek in seventy-five minutes with the help of a thirty-four-mile “tangent,” one of the longest sections of straight track that allowed the carriage to travel at fifty-five miles per hour. 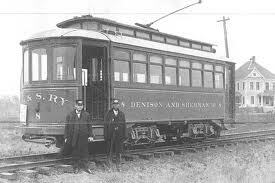 Passengers rode to Galveston for an evening on the beach or in the gambling houses and then took the late interurban back to Houston. The frequent service, convenient stops within cities, and lower fares of the interurbans overcame all competition with steam railroads. At the peak of the service in 1920, nearly four million passengers enjoyed the trolleys—the carpeted cars with lounge chairs, spittoons, and rest rooms. By 1931, ten systems across the state covered over five hundred miles. The advent of the automobile and the convenient travel it offered spelled doom for the interurbans. The lines began closing, their tracks being paved over to make way for their competition, the automobile. On December 31, 1948, the old Denison to Dallas line made its last run. Too bad we never developed good public transportation in this country. I lived in a cabin the size of a double-car garage for four years. Even used a wood stove to heat our Austin winters. I’ll let you have the small spaces. Thanks for reading. Thank you. I agree, we need the interurbans. Bring back the interurban. The parlor car looks so comfy. Great story, Myra.